Weighty Matters: Do artificial sweeteners enhance fullness? Judging by our growing waistlines probably not, but I'm reporting on this study to support a point. The study, a small one published in the journal Diabetes Care in December of last year, investigated blood levels of GLP-1 (a satiety peptide which when produced increases satiety), glucose and insulin in 22 healthy weight individuals following the ingestion of diet soda or carbonated water prior to the consumption of 75grams of glucose. Following ingestion of artificially sweetened beverages the subsequent ingestion of a sugar load led to enhanced release of GLP-1. So can anybody draw real life conclusions from this study? Nope. The study's small, it didn't look at actual satiety and there are many more components to diet soda than just artificial sweeteners. So why did I bother to post? 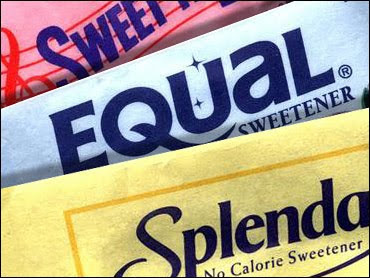 When it comes to artificial sweeteners it seems to me that the media and blogosphere tends to report based on the visceral belief that artificial sweeteners must be bad for us and that belief supersedes good evidence based reporting and leads folks to report on bad, preliminary or weak studies as evidence that sweeteners are unhealthy. The corollary to this is that bloggers and the media, while regularly trumpeting results from small studies as vilifying for sweeteners virtually ignore studies that suggest perhaps sweeteners aren't so bad or in some cases perhaps even good. While I don't have any disclosures to make regarding ownership of shares or income streams from the sweetener industry my take on the weight of the evidence places the consumption of excess amounts of sugar as a riskier behaviour than the consumption of artificial sweeteners. The point of this post? To remind my fellow nutrition bloggers, writers and readers that evidence trumps belief. Before/when writing/reading a blog post or article consider the underlying study and ask yourself whether or not it's important enough to care about. Rat and mice studies, studies with very small numbers of folks, poorly controlled studies - certainly they can be interesting and can also point the way to future research, but please don't hang your hats on them.